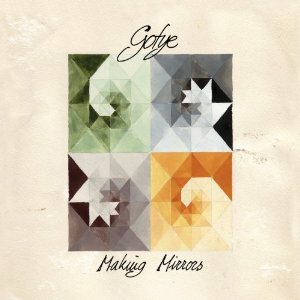 Gotye’s hit song, “Somebody That I Used To Know” is a piece of good taste, performance, arrangement and mixing; definitely a masterpiece. The song appears on his 2011 album, Making Mirrors. Let’s take a closer listen to the “magic” Wally De Backer and his fellow musicians created, so you can see that clever placement of little details, repetition and constant changes can elevate a song without compromising its focus, organic sound and apparent simplicity. The song is in the key of D minor, and the chord progression is the following: alternating Dm and C chords for the verses, and Dm, C, Bb, C in the choruses. Kimbra’s verses have a twist on the regular chord structure: after the alternating Dm and C chords, it goes to the C chord and stays there for 8 measures long. Gotye sang into a Neumann M147 microphone that he plugged into an SSL XLogic Alpha Channel mic preamp, and he recorded it on a Macbook, with the DAW called Ableton Live installed. The real trick is in the arrangement, it forces the listener to pay attention all the way through the song with its frequent changes. Even though the song sounds catchy and simple on the surface, sometimes it becomes quite a challenge to follow and identify all the little details, riffs and dynamic changes. The song starts with a looped acoustic guitar sample that plays pretty much all the way through the piece. The sample was taken from a 1967 Luiz Bonfá tune, “Seville”. At 0:03 a couple of round sounding toms and a xylophone enter on the left side, the latter playing one of the signature hooks of the song. The lead vocal starts very low key at 0:18, with some saturation, reverb and a good amount of compression to make every word intelligible, despite its softness. At 0:48 the lead vocal stops and a very sparse synth bass line enters. There’s also a synth hook, a brighter tom riff and electric guitar chords on the right. At 1:03 the lead vocal comes in again, with a clean electric guitar riffing on the left side, with well audible delay. There’s also a very soft and distant hi-hat playing on the left. A nice little hook is the single whistle note at 1:08, doubling the top note of the sampled acoustic guitar chord in unison. Arriving at the 1:29 marker, everything stops at once, except the lead vocal and the sampled acoustic guitar loop, to set up the drama of the chorus. And the chorus comes at 1:33, with stacked and saturated lead vocals, with a bass in the low end. There’s a cowbell on the right side, tuned bongos on the left playing percussive chords, a clean electric guitar through what sounds like a Leslie cabinet in the center, and stacked flute tracks playing synth pad like textures in the background. 2:06 in, the xylophone starts again, and at 2:16 there’s a high tuned, reggae sounding snare riff as well. At 2:18, the tom part and a new reverbed acoustic guitar track start again on the left, with a synth riff on the right. An acoustic guitar plays a note right when Kimbra starts to sing at 2:32. There’s reverb and compression on her voice, which is soft and breathy sounding in the beginning of her verse. The electric guitar chords on the right come from quite a distance at this part. The stacked flute tracks start playing chords at 2:37 in the center. There’s an acoustic guitar note again at 2:43 doubling Kimbra’s voice at that point. At 2:47, the bright toms and the mellow synth enter again on the right side, with a bass in the center playing the C pedal note. At the end of her part, Kimbra’s vocals get stacked over the “…used to know” line, right when everything else stops at once, before the closing chorus, that starts at 3:02. The arrangement is the same as for the first one, except there are harmony vocal parts by both Kimbra and Gotye in place of the flute chords, and there’s an additional shaker on the right. From 3:31 on there are repeated “somebodies” by Gotye, with an exciting roomy sound, and the xylophone hook starts playing again as well. At 3:47 the right side electric guitar chords and the mellow synth hook enter again, and Gotye’s harmony vocals get dryer and softer, coming close to the listener. A xylophone roll ends the song, and with it, everything stops at once on the last note.